TAMPA, FL--(Marketwired - Mar 18, 2015) - If Busch Gardens is known for its winning combination of wildlife and rollercoasters, then the Tampa Marriott Westshore is taking a walk on the wild side with its latest promotion. Offering guests discounts on accommodations, admission to the park and even transportation, the Busch Gardens Tampa Room and Ticket Package has travelers roaring with approval. The features of the package are as impressive as the Bengal tigers and Bornean orangutans on display at Busch Gardens. Guests enjoy a 20-percent discount on weekend rates at the hotel, a 20-percent discount on tickets to Busch Gardens and complimentary self-parking on property. Plus, as one of the premier hotels near the Tampa airport, the hotel offers free shuttle service to the terminals, which are located less than three miles away. So many practical discounts easily make the Busch Gardens Tampa Room and Ticket Package one of the best hotel specials available, especially considering the amenities on offer at the property. Guests are treated to a sparkling indoor-outdoor pool, an on-site Starbucks and 32-inch, LCD HD televisions in the guest rooms. 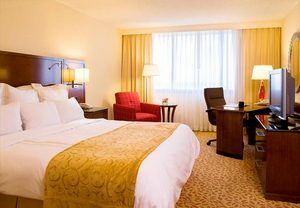 Plus the hotel's location in the Westshore business district puts visitors within steps of shopping, dining and nightlife, while attractions like the International Plaza Mall, sports arenas and beaches are all close by as well. And then, of course, there is Busch Gardens itself, where families can embark on a Serengeti Safari to see zebras, giraffes and ostriches across the 65-acre attraction or discover hippos, cheetahs and lions while on the Heart of Africa Tour. Rollercoasters like the Sand Serpent, Scorpion and Cheetah Hunt get heart rates racing, while shows, shopping and dining promise an action-packed adventure. Between the attractions and the equally attractive discounts, the package offer makes it easier than ever to explore the jungles, wilds and plains located in Florida's own backyard. The Busch Gardens Tampa Room and Ticket Package is available through December 27, 2015 by using the promotional code THM. To make reservations or for more information, call 1-800-228-9290. With a convenient location, award-winning service and environmentally-responsible hospitality, the Tampa Marriott Westshore extends a warm welcome to visitors. The certified green hotel boasts 310 guest rooms and suites, which are outfitted with features like Plug-in Panels, HDTVs and coffee/tea service. (Concierge-level rooms with enhanced amenities are available as well.) A fitness center and indoor-outdoor pool let guests easily embrace Florida's active lifestyle, and its Tampa Bistro Blue restaurant makes refueling both simple and delicious. Business travelers find inspiration within the hotel's 22 meeting rooms, which include a 500-person ballroom and on-site exhibition space. And no matter if guests arrive for work or pleasure, the hotel's location near the Tampa, Florida airport puts the city's best beaches, shopping, dining and nightlife within easy reach. Now through December 27th 2015, Tampa Marriott Westshore is offering weekend guests an exciting package that includes a discount on guest rooms, Busch Gardens tickets and complimentary on-site parking.